Are you as excited about stone fruit season as I am? I get so excited when I see apricots, plums, nectarines and peaches appear at the farmers market. Nectarines are by far my favorite stone fruit, but I have recently grown to love apricots. Especially apriums. Have you had an aprium? I hadn’t either until last weekend, but since the first bite I’ve been desperately craving these plum apricot hybrids. 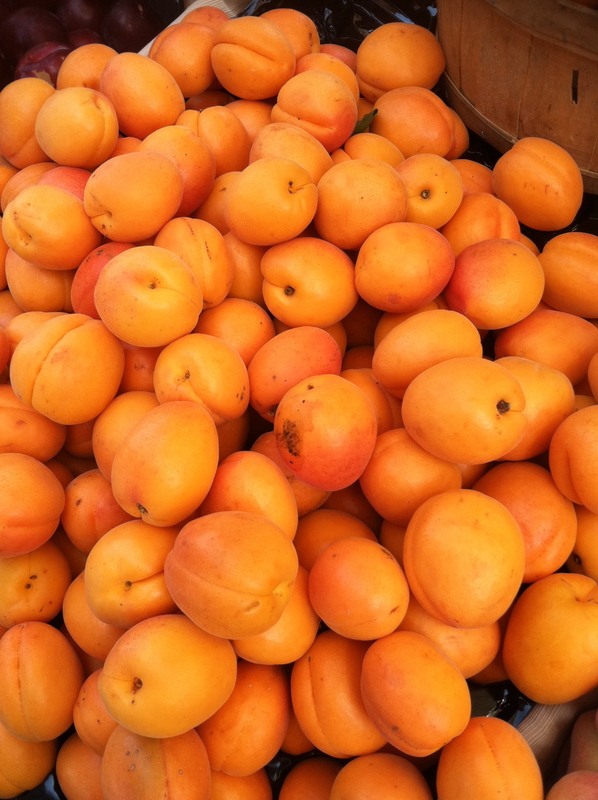 They are ¾ apricot ¼ plum with a nice honey sweetness. 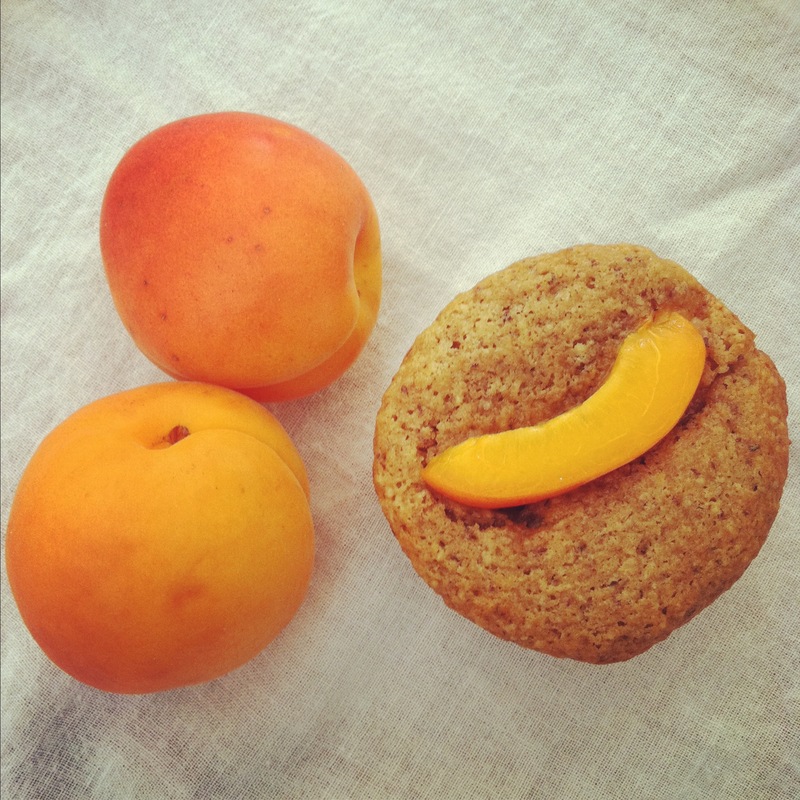 Inspired by my farmer’s market finds I bring you Ginger Aprium muffins. They are bursting with apriums and singing with ginger heat and sweetness. Honey rounds out all of the flavors. These muffins are sweet, juicy and tender. They scream summer. Perfect when enjoyed in the sunshine. You can enjoy apriums, red velvets, pluots, nectarines and peaches from the Arnett Farms stand at the Hollywood Farmers Market every Sunday. They are the best! Preheat oven to 350˚F. Place the butter, honey and 1 teaspoon ginger in a medium skillet over medium heat to melt the mixture. Cook until the mixture begins to bubble, then add the apricots and stir gently to coat. Set aside. Sift together flour, hazelnut meal, brown sugar, baking powder baking soda and salt. In a separate bowl, whisk together melted butter, sour cream, milk, vanilla, egg and ginger until combined. Mix the wet ingredients into the dry ingredients and stir gently to combine. Fold in diced apricots. Fill muffin tin ¾ way with batter. Toss the apricots in the syrup to coat them once again. Tuck one apricot slice into the batter, and lay a second slice over top. Bake for 24 to 28 minutes, rotating the pan halfway through. The muffins are ready when they smell nutty and their bottoms are golden in color. Previous PostPrevious National Doughnut Day! Ooo! Apriums? I have not heard of them and now I must try them. I love the that spin on this recipe and the addition of ginger. YUM! Happy Monday! Never heard of Apriums! Now I’m going to have to keep an eye open for it 🙂 Lovely recipe! I’ve never heard of apriums before, but now I will have to look for them! Love peaches and cherries, but it was only last year that I started branching out more. Beautiful muffins! I need to come over for muffin sunday one of these days! Ooh! Apriums are such an excellent choice N! And candied ginger really makes these perfect. I don’t usually like fruit in my muffins (not even blueberry–I know I’m a freak) but these actually look super good! Great post! Always love reading your muffin posts! Nastassia! Nice to bake with you again!